There are at least two narrative dimensions to the famous Earthrise image. The first is political: as Americans looked at the picture of the earth taken from a spaceship orbiting the moon, it represented the national catchup with (and victory over) the Russians, who had amazed the world and announced their leadership in space technology with the successful launch of Sputnik in 1957. The second narrative might be spiritual: the photograph of the entire earth seemed to emphasize the unity of all life here, in spite of the incessant conflict among all species. The religious dimension was underscored by the reading from Genesis (see the description below). Christmas Eve, 1968. As one of the most turbulent, tragic years in American history drew to a close, millions around the world were watching and listening as the Apollo 8 astronauts - Frank Borman, Jim Lovell and Bill Anders - became the first humans to orbit another world. As their command module floated above the lunar surface, the astronauts beamed back images of the moon and Earth and took turns reading from the book of Genesis, closing with a wish for everyone "on the good Earth." We were told that on Christmas Eve we would have the largest audience that had ever listened to a human voice," recalled Borman during 40th anniversary celebrations in 2008. "And the only instructions that we got from NASA was to do something appropriate." 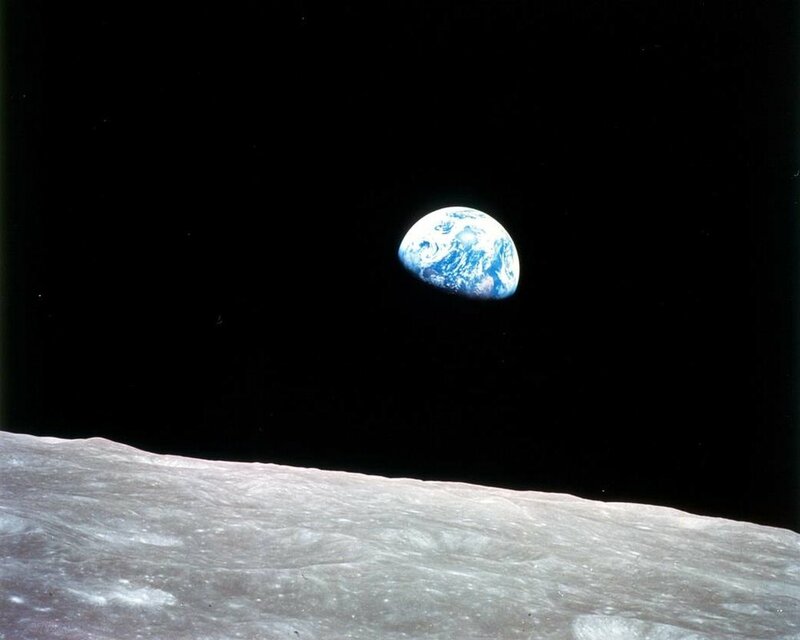 The mission was also famous for the iconic "Earthrise" image, snapped by Anders, which would give humankind a new perspective on their home planet. Anders has said that despite all the training and preparation for an exploration of the moon, the astronauts ended up discovering Earth.